My PhD research focused on the impacts of climate change on the wine industry in California, including coupling dynamically downscaled global climate model output with phenological development and quality models to project future wine quality in California (Hayhoe et al., 2004, PNAS). ​I developed a more empirical model of wine quality from a three-year field campaign to quantify the effect of vineyard-scale climate on the development of phenolic compounds in Pinot noir grapes. I found that anthocyanins (which give color to red wines) and tannins (responsible for astringency) were decreased by increasing heat during the final ripening period, and by light at the levels I measured in commercial vineyards (Nicholas et al., 2011, Ag & Forest Met). This means that wine composition and quality is vulnerable to climate warming, but could be at least partially offset by simple adaptations like changing vine pruning to shade the fruit more. In a series of papers led by David Lobell, we developed empirical weather-based models of crop yields for twelve major California crops based on a large dataset of historical weather and crop distribution and yields (Lobell et al., 2007, Climatic Change). We used these models to forecast crop yields earlier in the growing season and with considerably less resource investment than was possible with previous methods (Lobell et al., 2006, California Agriculture). We combined our crop models with the output of a suite of global climate models and emissions scenarios to project the impact of future climate change on crop yields, accounting for uncertainty (Lobell et al., 2006, Agricultural and Forest Meteorology). 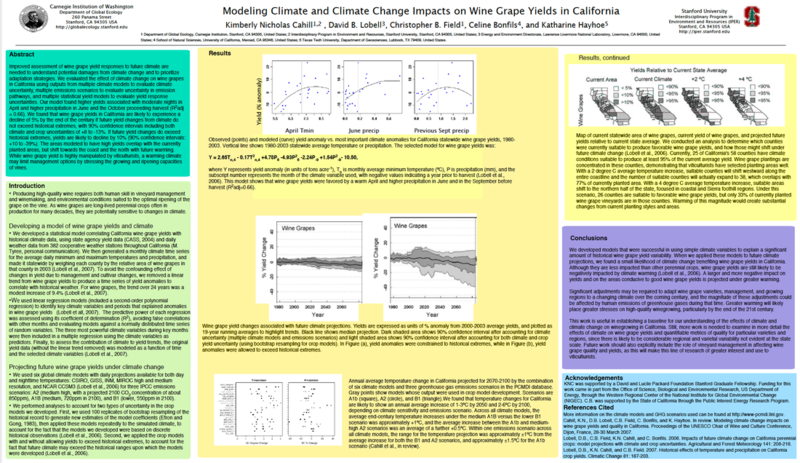 A summary of this work focused on winegrapes is in the poster below, presented at ASEV 2007 (download high-res here), and in a conference paper presented at a UNESCO conference, "Modeling climate change impacts on wine grape yields and quality in California."